I love the concept and idea behind Ali Edwards' "December Daily." The traditions and goings-on that make the holidays so important deserved to be remembered always! My mini albums with our daily December activities are our family's absolute favorite to flip through. I thought I'd spend a few moments looking at three years' worth of December Dailies! For this album, my very first attempt at a December Daily (and, it's actually only 12 days in December! Hey, whatever works right?!) I used chipboard for the covers and hand cut the "12" using an exacto knife then painted them white. I covered the first page with embellishments so they'd peek through the large numbers. 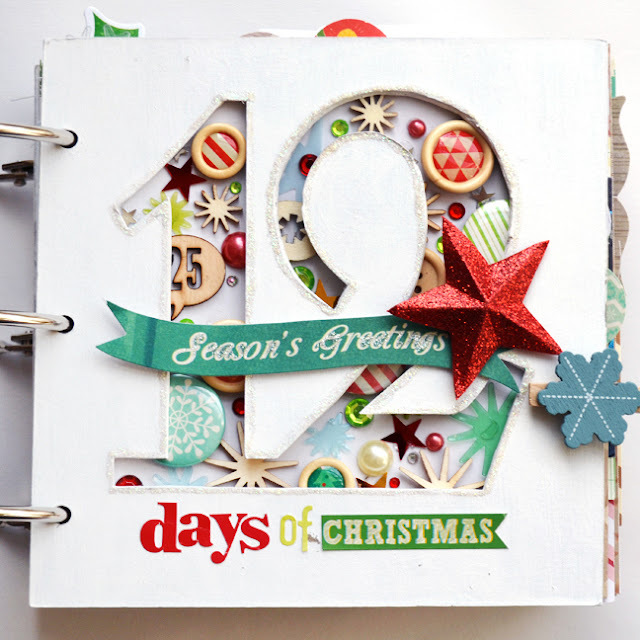 The inside pages are made from an eclectic mix of holiday collections. I tried to fit a whole bunch of mini photos on each page to help tell the story. This was probably one of my favorite Christmases because we spent it with my family in Seattle. This album's covers are made from white-washed painted wood. I drilled holes into a "25" and then added brads and buttons to define the shapes. The inside pages are once again a complete smörgåsbord of collections - I think by mixing and matching, they all go together! It's not December yet, but I wanted to get a head start on my December album. I went a unique route this time by using a MemoryDex as the foundation. I have about 4 metal "tag" dies and cut about 80 cards for the pages. There is still plenty of room to cut out our photos and add journaling! Putting in a little plug for a class: the entire start-to-finish process for my MemoryDex can be found in the A Heartfelt Christmas workshop that Wilna Furstenberg and I put together for the holiday season! Find out more about this class by clicking HERE. What about you, do you love the December Daily?! Gorgeous stuff! Love each one of them. Thanks for taking us down to the memory lane. Gah. These are so beautiful!